"To preserve the reputation of the fraternity unsullied must be your constant care..."
The World Cup Soccer matches are going on in South Africa this week, but fans don't generally know that the most popular sport in the world has a Masonic connection. The origins of modern soccer came from English and Scottish villages. Mob football probably started as a way of celebrating a military victory, as early as the Viking period. The game consisted of crowds madly attempting to get an inflated pig's bladder from one goal to the other, and apparently anything shy of actually murdering each other was permitted. The game was eventually outlawed, but it evolved into an only slightly less violent version for another five centuries. In the 1820s, the game became popular at English boys's schools like Eton, Harrow, Rugby and Westminster, without the murderous intent. Each school developed its own rules, and the game was played in a field with no boundaries. Association football was born in 1863 at the Freemason's Arms Pub near London's Covent Garden, at 81-82 Long Acre. Six meetings were held at the pub to decide on rules and structure, and the meetings ended with a split between the new Football Association ("soccer" is said to be a truncated version of "association") and the proponents of different rules that became rugby. 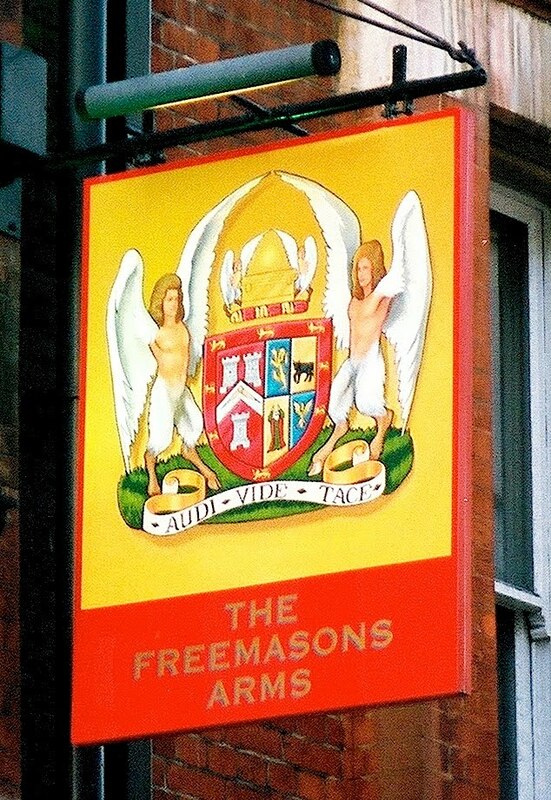 The Freemason's Arms pub was built in 1860 and is still open today. 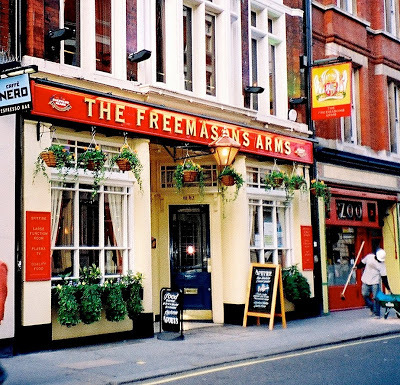 It began life as the Freemason's Tavern, which originally stood where the United Grand Lodge of England's New Connaught Rooms are today on Great Queen Street. London's Freemasons' Hall is literally right across the street. The Switzerland-based FIFA (Fédération Internationale de Football Association) has a video on its website that commemorates the meeting. Kindly sign your comment posts. Anonymous postings on Masonic topics have the same status as cowans and eavesdroppers, as far as I am concerned, and may be deleted if I don't recognize you or if I'm in a grumpy mood. Freemasonry is the world's largest, oldest and best-known gentleman's fraternity. It is based on the medieval stonemason guilds who built the great castles and cathedrals of Europe. Modern Freemasons likewise use the tools, traditions and terminology of those earlier stonemasons as allegories for building Temples in the hearts of men. At its core, Freemasonry is simply an attempt to make the world a better place, one man at a time. For that man, it can become as simple or as complicated as he himself desires. It's not for everybody. Maybe it's for you. MASONIC SERVICE ASSOCIATION HAS ISSUED OFFICIAL DISASTER APPEALS FOR PUERTO RICO, TEXAS & FLORIDA FREEMASONS AFFECTED BY RECENT HURRICANES! CLICK HERE for my explanation of why and a shortcut fix for your eyesight. NEW FOR SCOTTISH RITE NMJ MEMBERS! Christopher Hodapp is the author of Freemasons For Dummies, the best-selling introduction to the Masonic fraternity, and the world's most popular Masonic news blog site; Solomon's Builders: Freemasons, Founding Fathers and the Secrets of Washington D.C. ; and Deciphering the Lost Symbol. He is also the co-author with Alice Von Kannon of The Templar Code For Dummies and Conspiracy Theories And Secret Societies For Dummies. 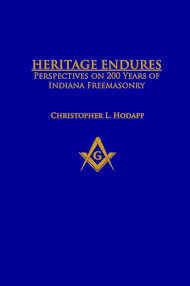 His latest major book project is Heritage Endures: Perspectives On 200 Years of Indiana Freemasonry" and was published in January 2018. In 2008 he became the founding Editor in Chief of The Journal of The Masonic Society. He remains a regular contributor, and its Editor Emeritus. He received his college education at Indiana University, the University of Southern California, Los Angeles Valley College, California State University at Northridge, and Indiana/Purdue University at Indianapolis. Chris spent twenty-three years in advertising as a commercial filmmaker for Dean Crow Productions, shooting and editing close to 1,000 commercials, music videos and feature films. He has written scripts for corporate and non-profit clients, and his voice has appeared in countless television and radio commercials. For those who really care about such things, as a Freemason he is a Past Master of Broad Ripple Lodge #643 and of Lodge Vitruvian #767, Free & Accepted Masons of the State of Indiana; and a member Internet Lodge #9659 in the Province of East Lancashire of the United Grand Lodge of England. He is an honorary member of Vincennes Lodge No. 1, Plymouth-Kilwinning Lodge #149, Ancient Landmarks Lodge #319, Garfield Lodge #569, and Logan Lodge #575 in Indiana; Ancient York Lodge No. 89 in Nashua, NH; African Lodge #459, Prince Hall Affiliation, in Boston, Massachusetts; and the Grand Lodge of New Mexico AF&AM. Chris is a 33° Mason in the Ancient Accepted Scottish Rite, Indianapolis Valley. He is a founding member of Levant Preceptory, a medieval Knights Templar period recreation degree team in the York Rite, and he is an officer of the Indiana College of the Societas Rosicruciana in Civitatibus Foederatis. He is also member of numerous other Masonic appendant organizations, including Shriners International Murat Oasis in Indianapolis. Chris is a Founding Fellow of The Masonic Society. He is a member of Indiana's Dwight L. Smith Lodge of Research U.D., Iowa Research Lodge No. 2, the Scottish Rite Research Society, the Philalethes Society, the Grand College of Rites of the United States of America, the Bristol Masonic Society, and the Quatuor Coronati Correspondence Circle. He and Alice live in Indianapolis with their very French poodle, Wiley. "Old Masters Scotch" Coming Soon To the U.S.
Where Are Our Military Lodges? Historic Montana Masonic site vandalized. Again. "Freemasons For Dummies" ©2005-17 by Wiley Publishing Inc. The 'For Dummies' logo and artwork are trademarks of Wiley Publishing Inc. and all rights are reserved.